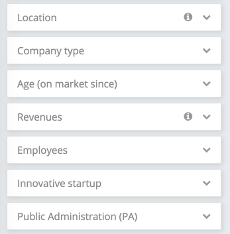 Get quick access to the company profile of your customer, competitor or supplier. Speed up the search process and improve your productivity. 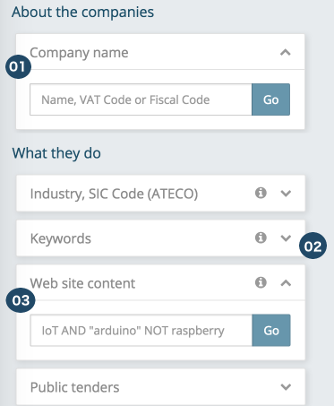 Thanks to Atoka's proprietary semantic engine, combined with Atoka's powerful artificial intelligence algorithms, you can expand your search way beyond standard SIC/NACE Industry codes. It's like web search engines you're familiar with, except its results are limited to corporate websites to eliminate all the noise. The possibilities are endless, from a simple product search, to more complex queries that you can combine with other filters to find exactly what you're looking for. 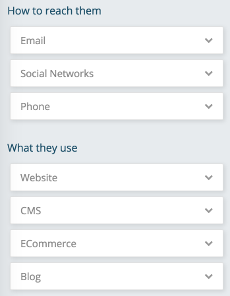 Go directly to company email addresses, verified and categorized by business function. Catalogue companies by revenues, financial trends, age on the market. Quickly select startups or innovative SMEs. 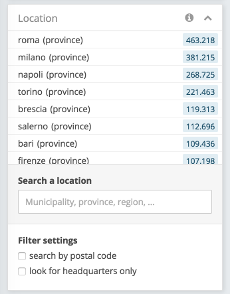 Filter by address (country, municipality, region, province) or ZIP codes. All their branches, sites, and points of sale, not just registered addresses. Find companies with an e-commerce platform or using a specific web technology. Select the ones that are more active on social media or have active blogs. 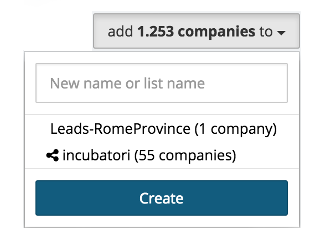 Create and save your searches and lists to acces them faster. Easily share them with your colleagues. 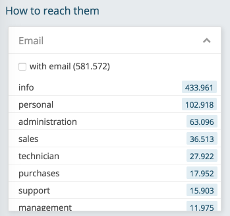 Export your lists to Excel or load them into your CRM. Try it now: 5-day free trial plan (no credit card required, no commitment). Our experts are ready to help you via mail and chat.